When Joypad support was added to AM2R, I received a lot of suggestions on how to improve it. Most of them were regarding compatibility with XBox 360 joypads, how they are detected and how the trigger buttons aren't registered as buttons. Furtunately, I was able to afford a wireless XBox 360 gamepad a couple of weeks ago, and I was able to add XInput support to the project, and properly test it. The gamepad is recognized in-game, and it has a dedicated button remapping screen on the options menu. So, every aspect that has a score of 3 is ready (but has room for improvement). Depending on the relevance of the particular area or feature, a revision might still be needed. As you can see, the game has most of the contents in a functional state. There's still many aspects that need that extra layer of polish that makes AM2R (at least what you play on the demo) a faithful Metroid experience. Level design wise, those are being tackled in order, this will allow for a future demo release with more quality contents. Feel free to discuss or send your suggestions here or at the Forum. Looks like the game's development is actually much further than I thought! Good job! We can wait as long as necessary, keep up the good work. This is feeling more and more like a Nintendo/Metroid worthy project with every demo update! But I'm just curious, as I'm taking a different approach, why did you take the Zero Mission approach? I'm modeling everything I can after Super (Physics, sprites, atmosphere, color, etc), just because I liked that game a lot more than ZM. Why choose the Zero feeling? Thanks for the update! My otherwise cold heart warms up whenever I think of AM2R and all the hard work you are putting into this. Not worried about Modding Support. Quiero decirles que hace tiempo que estoy siguiendo su remake y que me alegra ver esta actualización!!! Me jugué el Metroid confrontation y me fascinó asi que espero con ansias este... pero como siempre digo: demoren todo el tiempo que quieran con tal de que el juego quede lo mejor posible. Wait... WE WILL BE ABLE TO MOD THIS?! SWEET!!!!!! I have a game idea and wanted to use this engine! Thank you soooooo much! I can't wait!!!! This is coming to Steam?! Life just got a whole lot better. Nice. I look forward to the release. The music is awesome by the way. Wow I had no idea this was so far along... so excited!!!!! this area 5... hmmm I don't think there was an area 5 in the original. interested to see this area 5 says I. It would be intresting to see what happens to the rescue team. I'm hoping those of us with old fashioned logitech USB game pads can use those as well :) If not, joy to key. Your updates always brighten my day, Doc. Please use this template regularly to show us how things progress. I really hope to see a 1.0 release soon, but it's good to see you've got so much already built. This game is really coming together, and in the best way, might I add! Keep this up; you may be Metroid's last hope. Awesome man it's clear you've put so much effort in so far if the demo's any judge. It feels like a natural progression in the series. Good luck and keep it up! So this will be done when everything is a 5? this 360 controller support, how does it work? do i just plug it into the usb port and go? can u allow use for a PS3 controller? (i currently dont have a xbox 360 controller, i do plan to get one though)other than that, good job! My anticipation for this game = 6! I would be perfectly happy with solid 3's across the board, but I do like the "update it twice and then done" strategy. Everything doesn't need to be perfect, though I'm sure with you, it will be! This baby lets you hook a PS3 controller into your computer via USB or even bluetooth and "emulate" an Xbox360 for Windows controller. No need to code for it. I use it all the time with my Steam enabled games. This project started in 2006! That just goes to show how hard Doc has worked on this! Hes been goin' for over 5 years! Is it alright if I played this game and posted footage on YouTube about how amazed I was by it's awesomeness? Dr. M64, savior of the franchise. B.T.W. don't worry about time. By the time Nintendo released another 2D Metroid game you would be able to create AM2R 3x over. Sorry I am new to this posting. I just noticed that there was someone our there doing possibly the coolest thing ever remaking one of my all time favorite classic games. But I am a mac person will you release a mac friendly version? Why do you not have a kick starter? I know your busy, but some extra cash flow could allow you to take some time away form work to work on the game. I'd pledge. shouldnt the FMSR link lead to the FMSR reborn site? BTW, i cant wait till modding! Is the release on stream true? So someone tried to make an independent Metroid movie via kickstarter and Nintendo shut it down claiming all rights to the Metroid name and everything associated with it. I'd hate to see this project shut down as well. Tread carefully. uh-oh, omega nest and queens lair lair are 3s! XD Cant wate for this to be done! ive always enjoyed fighting that one gamma metroid, and i really exited about there being and entire area filled with them! also, the zetas in preveiw 3 look awesome! If it means anything, I check on this project every couple of months, and its always great to see its still in the works. 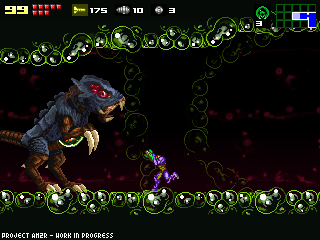 Metroid 2 was my first Metroid game, and I really enjoy seeing it being remade in any form. Keep up the awesome work. You are the Savior of Samus. Vaya que gran progreso!! esperando con ansias el siguiente informe espero todo vaya mejorando poco a poco!! saludos!! I can tell by the inclusion of the log entries that this is truly a labor of love. @Anon The ZM approach may have been because of the overall more fast paced feel and control that ZM gave. OMG THIS IS JUST GETTING BETTER AND BETTER I know you have heard this but man doctor of the M64th power you are a genius dude keep up the good work. Character customization? What do you mean?